Cutler worked in his brother's concrete construction business, Cutler Bros. Concrete, from the age of 11. He began training when he was 18 years old as a senior at Wachusett Regional High School. He graduated from Quinsigamond Community College in 1993 with a degree in criminal justice, intending to work as a corrections officer for a maximum security prison. He was inspired to enter bodybuilding after meeting personal trainer Marcos Rodriguez. Cutler excelled in bodybuilding, desiring to be one of the largest competitors ever, and took his first overall win in 1993 at the Iron Bodies Invitational. His first contest was the 1992 Gold's Gym Worcester Bodybuilding Championships, at which he took second place. As he established a name for himself in the bodybuilding scene, he often appeared in bodybuilding-related videos including Battle for the Olympia 2001, a pre-contest documentary video directed by Mitsuru Okabe that highlighted many competitors as they prepared for the 2001 Mr. Olympia Competition. He went on to win consecutive Arnold Classic titles in 2002, 2003, and 2004, and placed second to Ronnie Coleman in the Mr. Olympia competition four times before claiming the title again in 2006. At the 2001 Mr. Olympia, Cutler tested positive for banned diuretics, but sued and had his second-place finish reinstated. [verification needed] Cutler won the Olympia for a second consecutive year in 2007. He became the third Mr. Olympia in history (after Arnold Schwarzenegger and Franco Columbu) to win the title in non-consecutive years after defeating the reigning champion Dexter Jackson in 2009. In 2010, he won his fourth Mr. Olympia title, defeating Phil Heath. In 2011, Cutler was runner-up to Heath at the Mr. Olympia. In 2012, Cutler was unable to compete at the Mr. Olympia due to a biceps injury. Cutler competed in the 2013 Olympia and placed 6th. 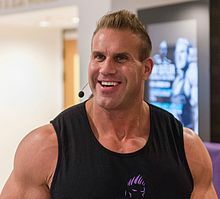 Cutler has since focused on his business venture, Cutler Nutrition, which specializes in bodybuilding nutritional supplements, in addition to his social media presence. Cutler resides in Las Vegas, Nevada. He has been featured on the cover of several fitness magazines such as Muscle and Fitness, Flex, and Muscular Development. ^ Milliard, Trevon. "Bodybuilding changing, but it's still hard work". Retrieved September 18, 2011. ^ "NewsPro Archive". Archived from the original on October 25, 2012. Wikimedia Commons has media related to Jay Cutler (bodybuilder). This page was last edited on 29 January 2019, at 12:45 (UTC).